Audio Setup Computer (Vo. IP) Audio 1 2 3 Phone Audio Click on the Audio Setup Wizard button in the Audio & Video Panel. 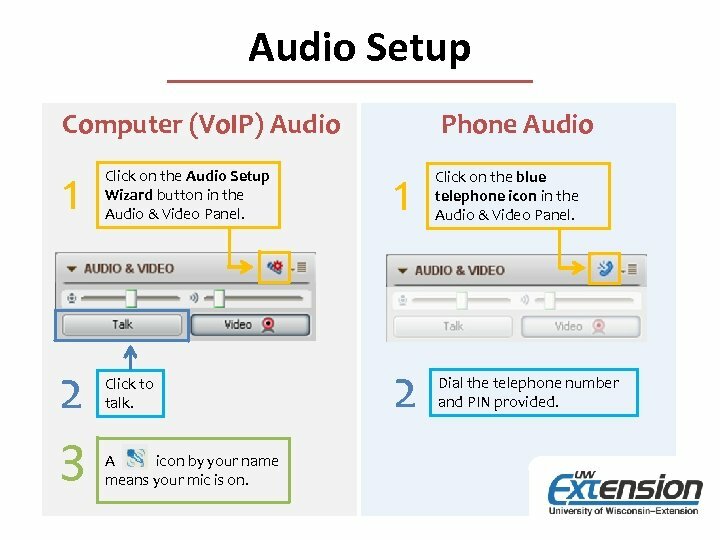 1 Click on the blue telephone icon in the Audio & Video Panel. 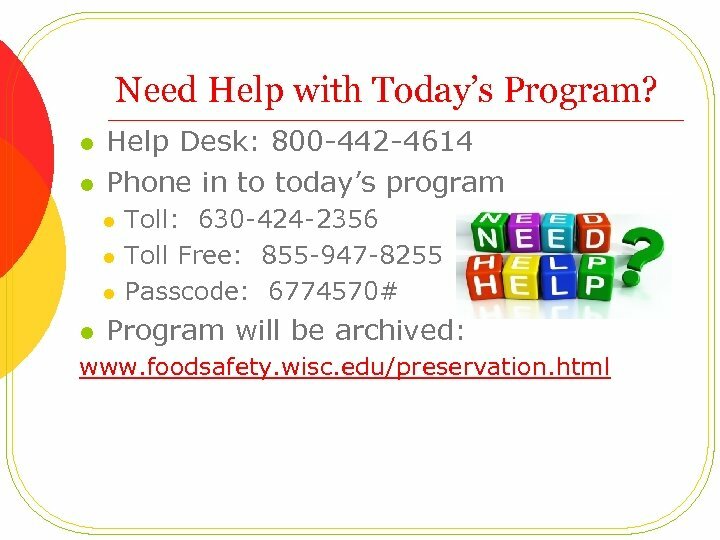 Click to talk. 2 Dial the telephone number and PIN provided. A icon by your name means your mic is on. 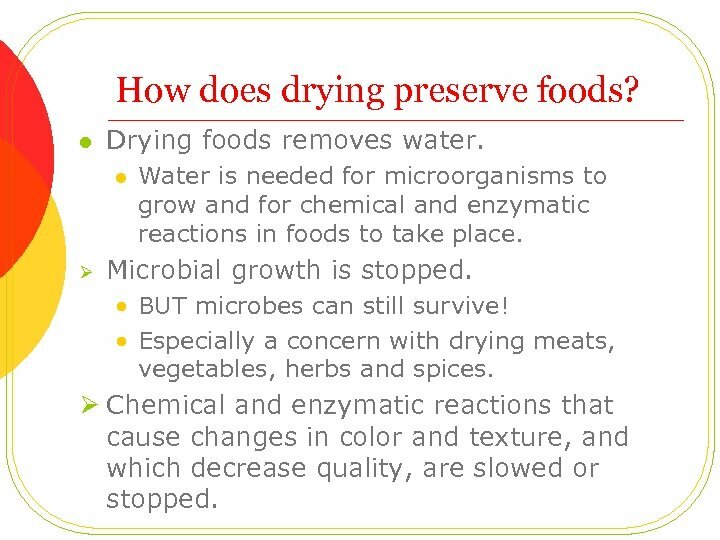 How does drying preserve foods? 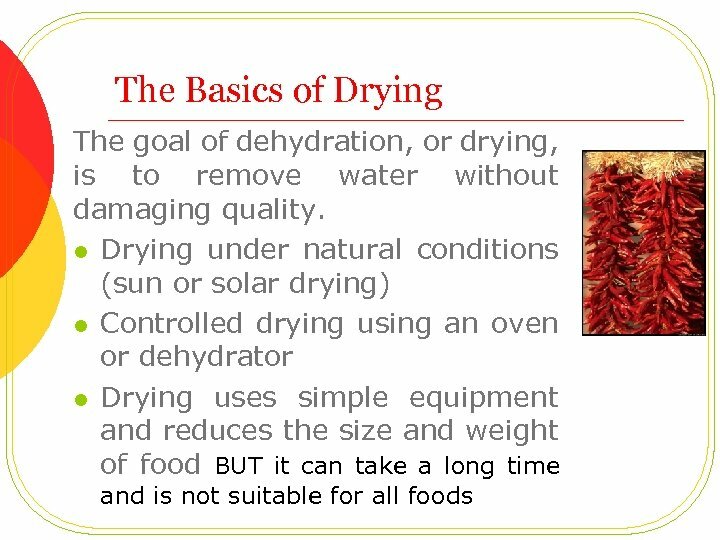 l Drying foods removes water. 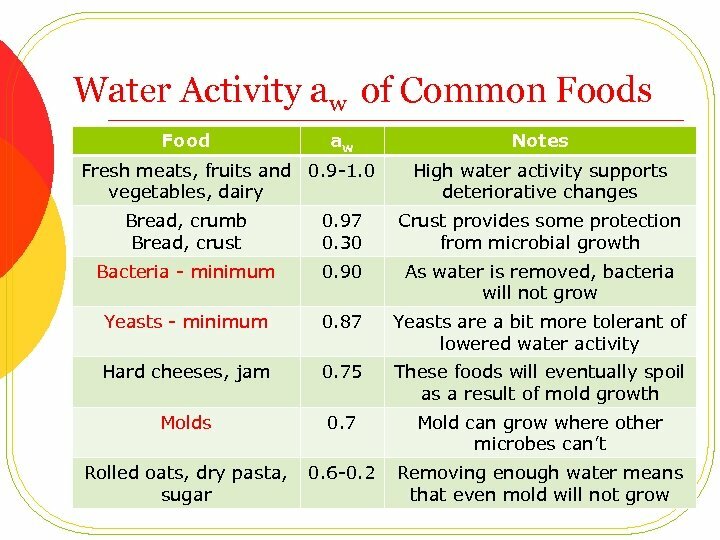 l Ø Water is needed for microorganisms to grow and for chemical and enzymatic reactions in foods to take place. Microbial growth is stopped. • BUT microbes can still survive! • Especially a concern with drying meats, vegetables, herbs and spices. Ø Chemical and enzymatic reactions that cause changes in color and texture, and which decrease quality, are slowed or stopped. 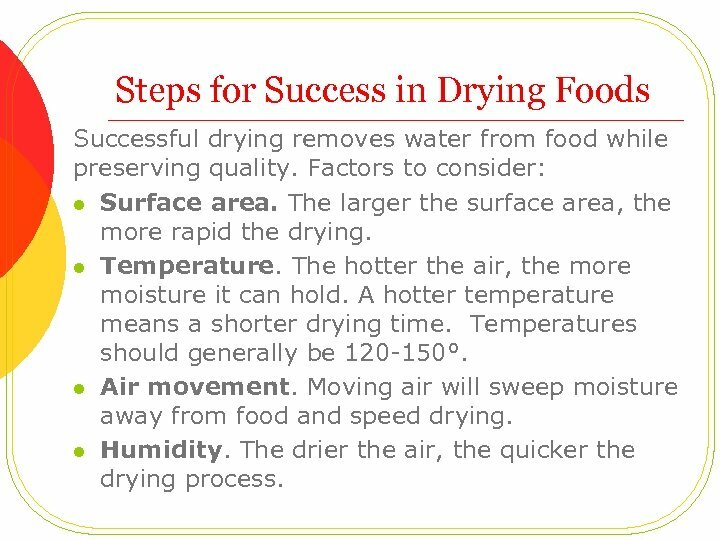 Steps for Success in Drying Foods Successful drying removes water from food while preserving quality. Factors to consider: l Surface area. The larger the surface area, the more rapid the drying. l Temperature. The hotter the air, the more moisture it can hold. A hotter temperature means a shorter drying time. Temperatures should generally be 120 -150°. l Air movement. Moving air will sweep moisture away from food and speed drying. l Humidity. The drier the air, the quicker the drying process. Preparing Food for Drying l l l Select firm, ripe fruits and vegetables for drying. 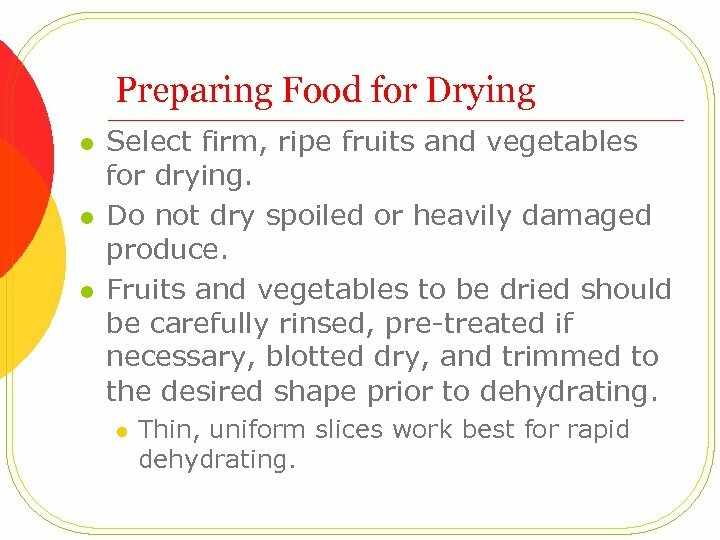 Do not dry spoiled or heavily damaged produce. 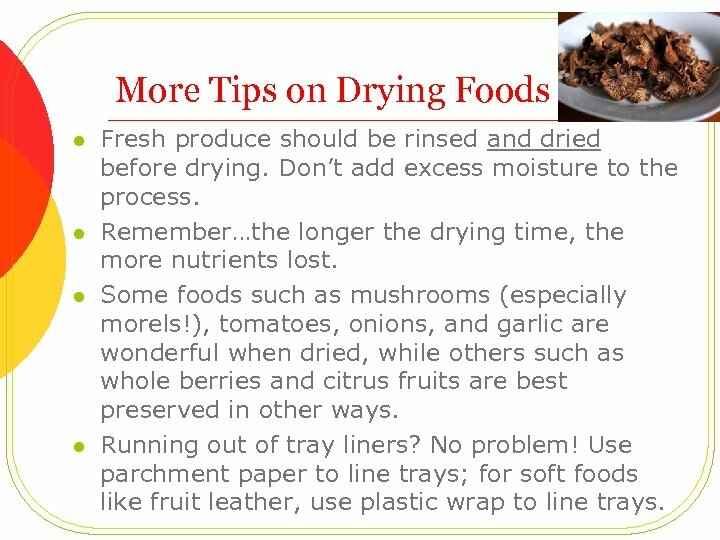 Fruits and vegetables to be dried should be carefully rinsed, pre-treated if necessary, blotted dry, and trimmed to the desired shape prior to dehydrating. l Thin, uniform slices work best for rapid dehydrating. 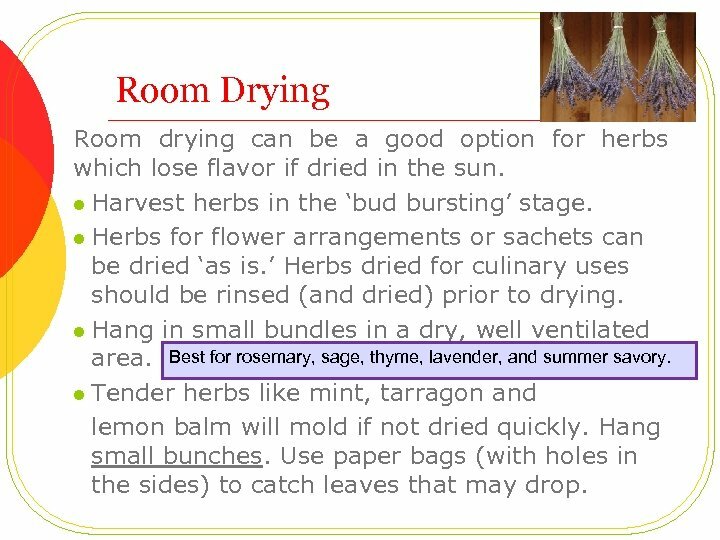 Room Drying Room drying can be a good option for herbs which lose flavor if dried in the sun. l Harvest herbs in the ‘bud bursting’ stage. l Herbs for flower arrangements or sachets can be dried ‘as is. ’ Herbs dried for culinary uses should be rinsed (and dried) prior to drying. l Hang in small bundles in a dry, well ventilated area. Best for rosemary, sage, thyme, lavender, and summer savory. l Tender herbs like mint, tarragon and lemon balm will mold if not dried quickly. Hang small bunches. Use paper bags (with holes in the sides) to catch leaves that may drop. 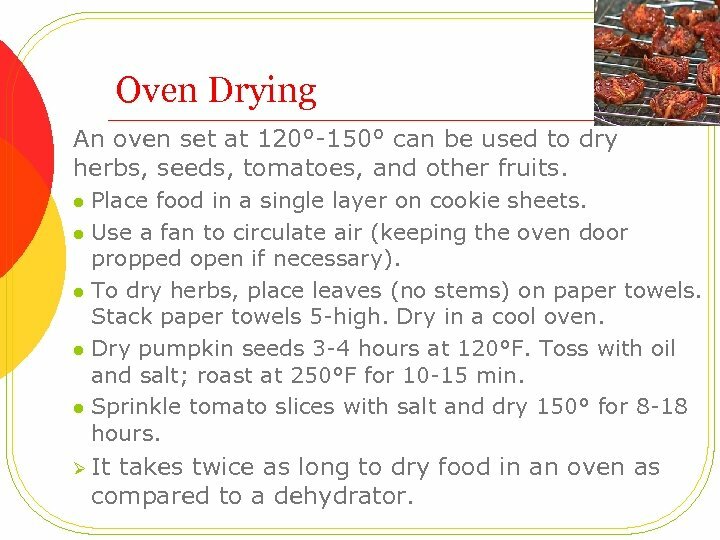 Oven Drying An oven set at 120°-150° can be used to dry herbs, seeds, tomatoes, and other fruits. Place food in a single layer on cookie sheets. l Use a fan to circulate air (keeping the oven door propped open if necessary). l To dry herbs, place leaves (no stems) on paper towels. Stack paper towels 5 -high. Dry in a cool oven. l Dry pumpkin seeds 3 -4 hours at 120°F. Toss with oil and salt; roast at 250°F for 10 -15 min. l Sprinkle tomato slices with salt and dry 150° for 8 -18 hours. 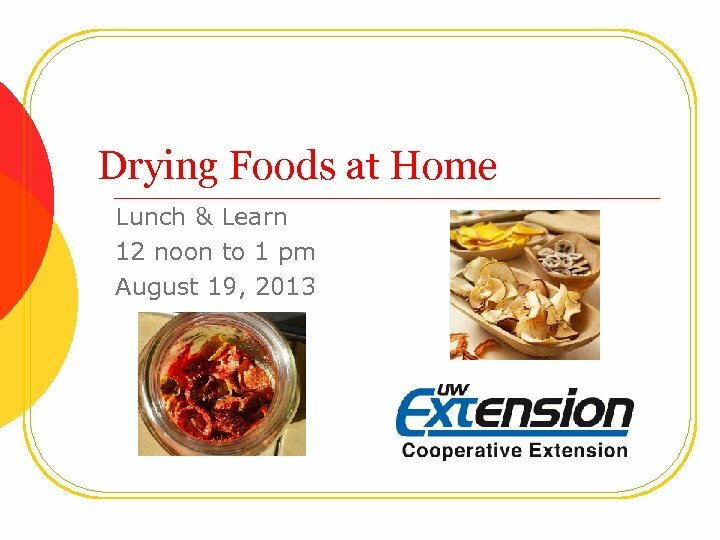 l Ø It takes twice as long to dry food in an oven as compared to a dehydrator. 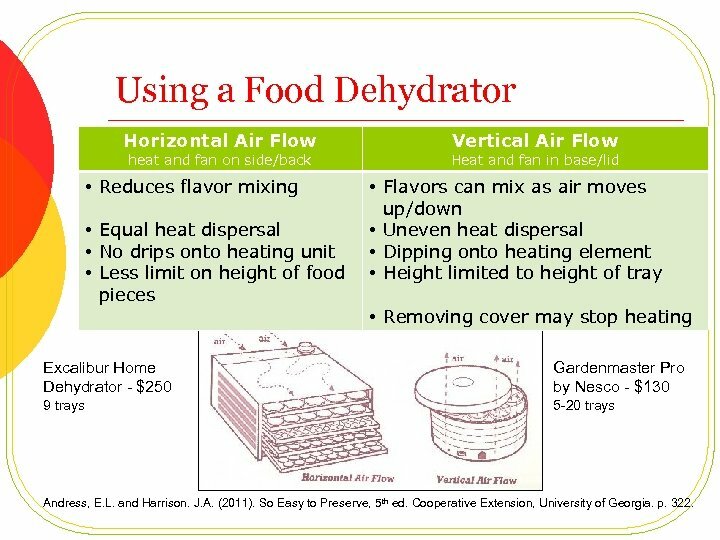 Using a Food Dehydrator Horizontal Air Flow heat and fan on side/back Vertical Air Flow Heat and fan in base/lid • Reduces flavor mixing • Flavors can mix as air moves up/down • Equal heat dispersal • Uneven heat dispersal • No drips onto heating unit • Dipping onto heating element • Less limit on height of food • Height limited to height of tray pieces • Removing cover may stop heating Excalibur Home Dehydrator - $250 Gardenmaster Pro by Nesco - $130 9 trays 5 -20 trays Andress, E. L. and Harrison. J. A. (2011). So Easy to Preserve, 5 th ed. Cooperative Extension, University of Georgia. p. 322. 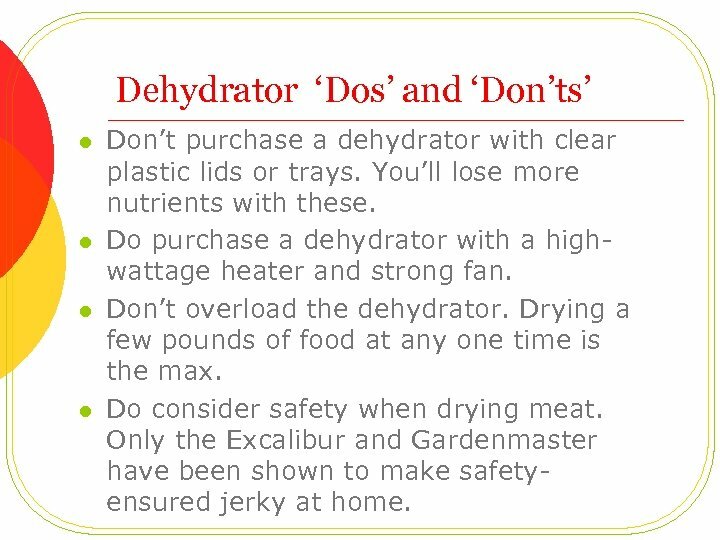 Dehydrator ‘Dos’ and ‘Don’ts’ l l Don’t purchase a dehydrator with clear plastic lids or trays. You’ll lose more nutrients with these. 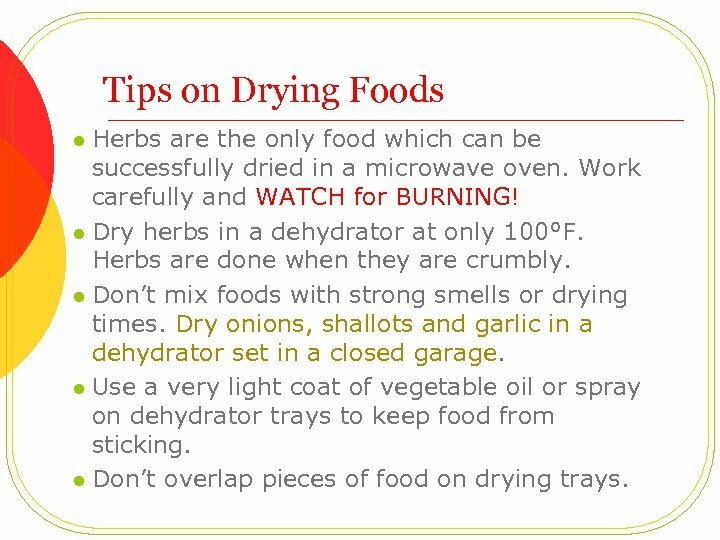 Do purchase a dehydrator with a highwattage heater and strong fan. Don’t overload the dehydrator. Drying a few pounds of food at any one time is the max. Do consider safety when drying meat. 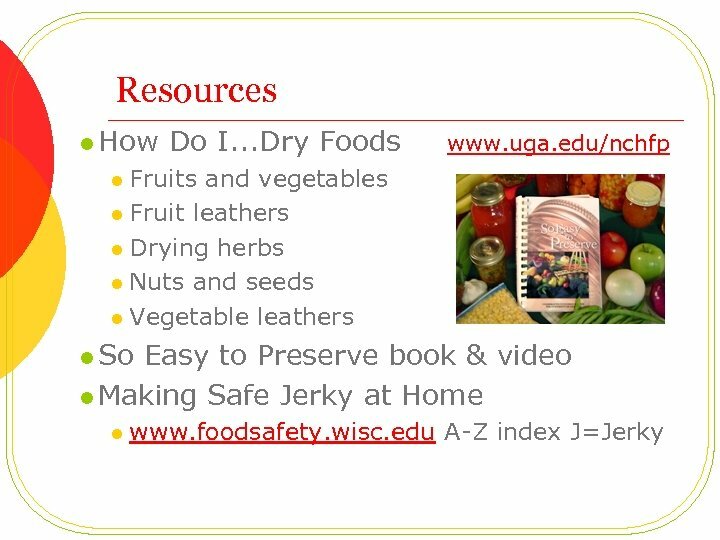 Only the Excalibur and Gardenmaster have been shown to make safetyensured jerky at home. 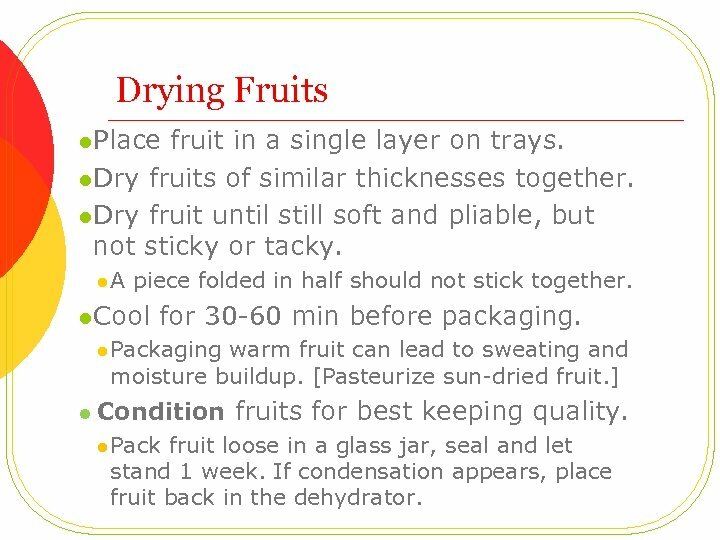 Drying Fruits l. Wash fruit, and peel and core if desired. l. Prepare thin, uniform slices for fastest drying. l Apple slices sprinkled with cinnamon sugar are a great snack. l. Spray trays or racks so fruits can be easily removed once dry. l Prepare grapes and blueberries by ‘checking’ skins. l. Try something new…dried watermelon and cantaloupe are unusual and fun. Drying Fruits l. Place fruit in a single layer on trays. l. Dry fruits of similar thicknesses together. l. Dry fruit until still soft and pliable, but not sticky or tacky. l A piece folded in half should not stick together. l. Cool for 30 -60 min before packaging. l Packaging warm fruit can lead to sweating and moisture buildup. 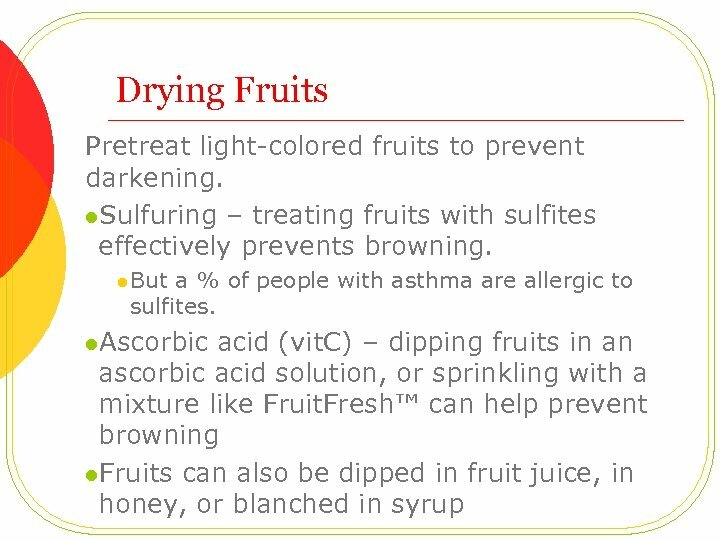 [Pasteurize sun-dried fruit. ] l Condition fruits for best keeping quality. l Pack fruit loose in a glass jar, seal and let stand 1 week. 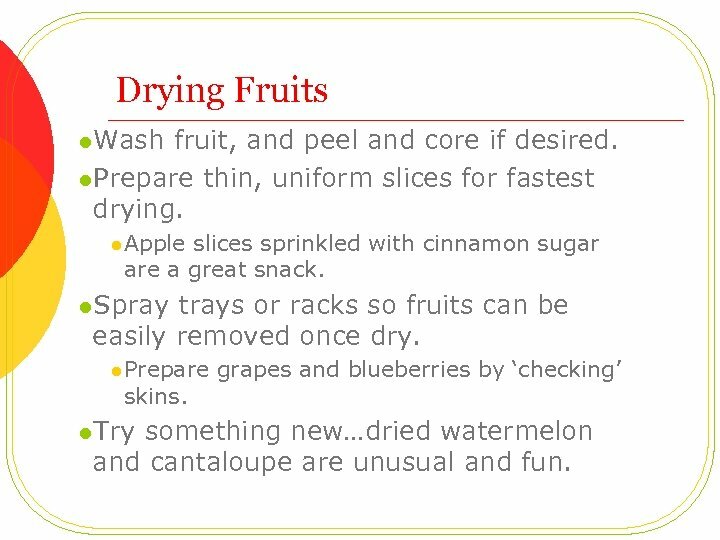 If condensation appears, place fruit back in the dehydrator. 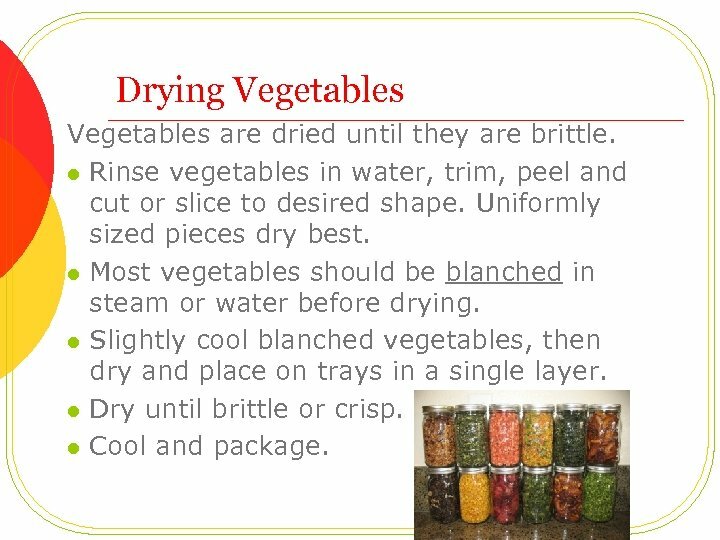 Drying Vegetables are dried until they are brittle. l Rinse vegetables in water, trim, peel and cut or slice to desired shape. Uniformly sized pieces dry best. l Most vegetables should be blanched in steam or water before drying. l Slightly cool blanched vegetables, then dry and place on trays in a single layer. l Dry until brittle or crisp. l Cool and package. Remember…. l Cleanliness, including hand washing, is key! l Use a thermometer to check dehydrator temperature. l Insert a thermometer between trays or place on tray. l Adjust appliance dial as needed. 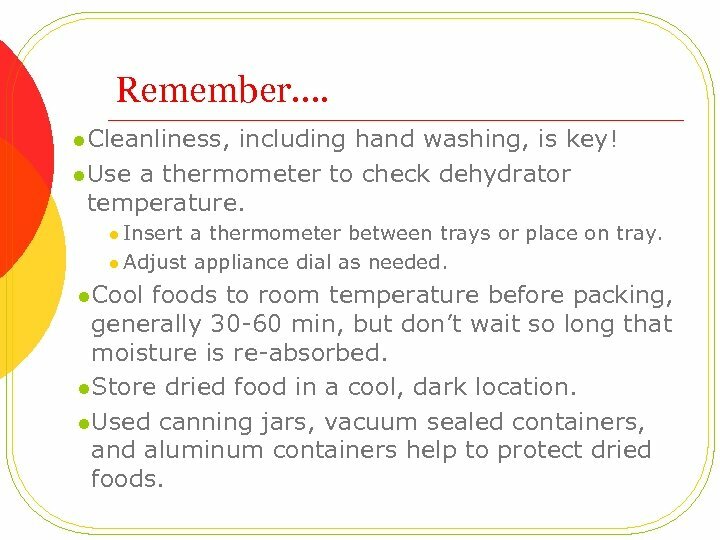 l Cool foods to room temperature before packing, generally 30 -60 min, but don’t wait so long that moisture is re-absorbed. l Store dried food in a cool, dark location. l Used canning jars, vacuum sealed containers, and aluminum containers help to protect dried foods. 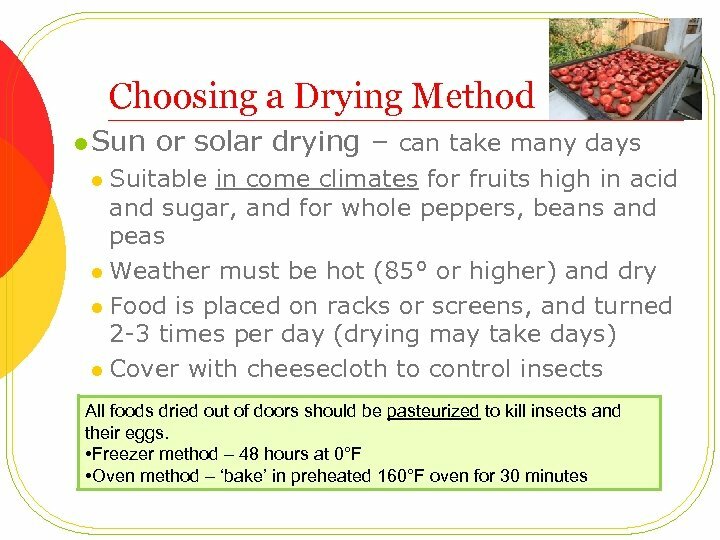 More Tips on Drying Foods l l Fresh produce should be rinsed and dried before drying. Don’t add excess moisture to the process. Remember…the longer the drying time, the more nutrients lost. Some foods such as mushrooms (especially morels! ), tomatoes, onions, and garlic are wonderful when dried, while others such as whole berries and citrus fruits are best preserved in other ways. Running out of tray liners? No problem! Use parchment paper to line trays; for soft foods like fruit leather, use plastic wrap to line trays. 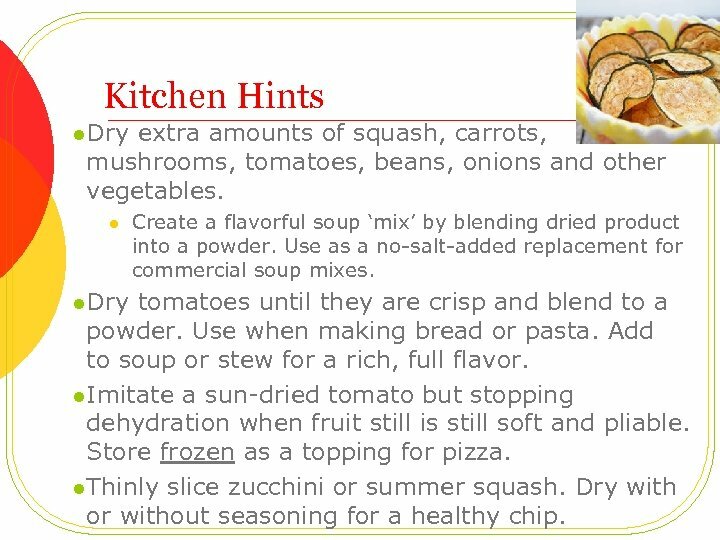 Kitchen Hints l. Dry extra amounts of squash, carrots, mushrooms, tomatoes, beans, onions and other vegetables. l Create a flavorful soup ‘mix’ by blending dried product into a powder. Use as a no-salt-added replacement for commercial soup mixes. l. Dry tomatoes until they are crisp and blend to a powder. Use when making bread or pasta. Add to soup or stew for a rich, full flavor. l. Imitate a sun-dried tomato but stopping dehydration when fruit still is still soft and pliable. Store frozen as a topping for pizza. l. Thinly slice zucchini or summer squash. Dry with or without seasoning for a healthy chip. 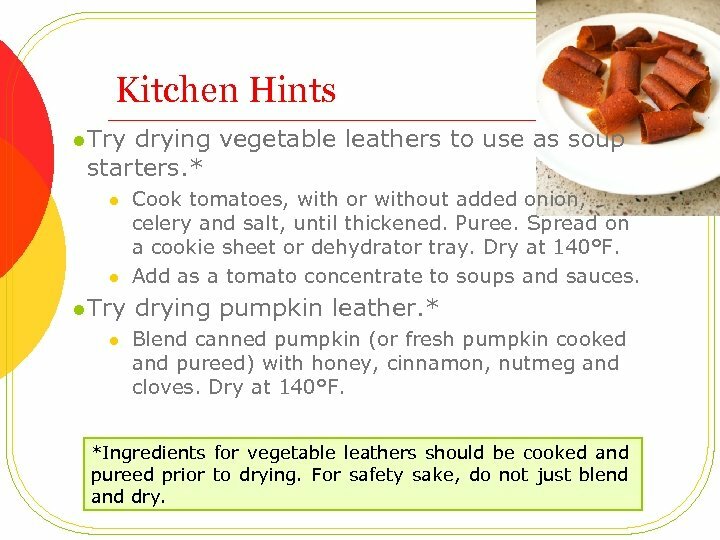 Kitchen Hints l Try drying vegetable leathers to use as soup starters. * l l Cook tomatoes, with or without added onion, celery and salt, until thickened. Puree. Spread on a cookie sheet or dehydrator tray. Dry at 140°F. Add as a tomato concentrate to soups and sauces. l Try drying pumpkin leather. * l Blend canned pumpkin (or fresh pumpkin cooked and pureed) with honey, cinnamon, nutmeg and cloves. Dry at 140°F. *Ingredients for vegetable leathers should be cooked and pureed prior to drying. For safety sake, do not just blend and dry. 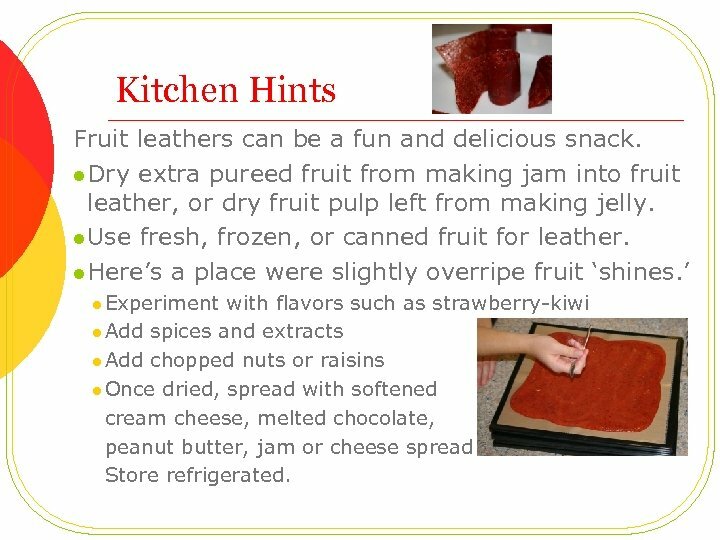 Kitchen Hints Fruit leathers can be a fun and delicious snack. l Dry extra pureed fruit from making jam into fruit leather, or dry fruit pulp left from making jelly. l Use fresh, frozen, or canned fruit for leather. l Here’s a place were slightly overripe fruit ‘shines. ’ l Experiment with flavors such as strawberry-kiwi l Add spices and extracts l Add chopped nuts or raisins l Once dried, spread with softened cream cheese, melted chocolate, peanut butter, jam or cheese spread. Store refrigerated. 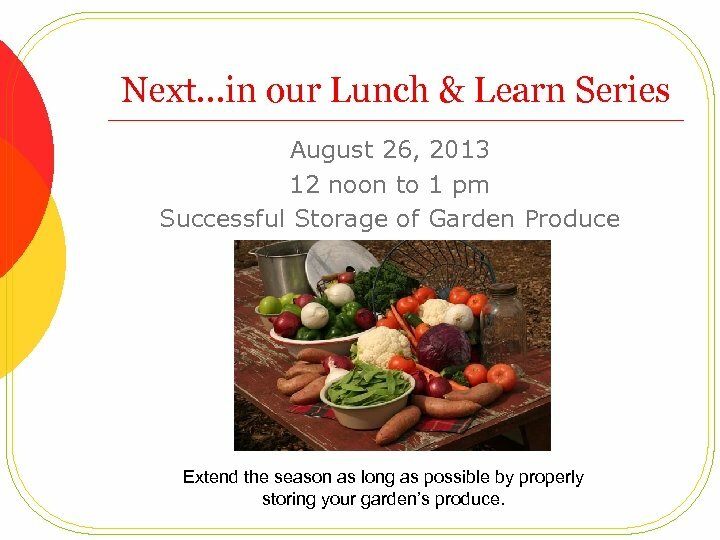 Next…in our Lunch & Learn Series August 26, 2013 12 noon to 1 pm Successful Storage of Garden Produce Extend the season as long as possible by properly storing your garden’s produce.